Lately my mindset has been shifting from focusing a LOT on shopping to more of a minimalist perspective. If you missed this conversation, please check out Part 1 of my journey here and Part 2 here! 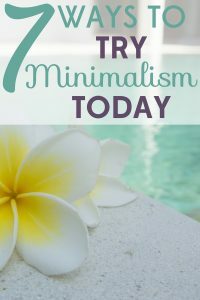 Here are 7 SIMPLE ways to apply minimalism in your life right now! Place a large box labeled DONATIONS in an easy-access spot. As you go through your week, fill that box with anything that is unnecessary or unused. Once it’s full, drop it off at your favorite charity store. Keep this system in place permanently and you will be able to eliminate excess easily! Simplify TOWELS. One of my favorite improvements is color-coded towels! We always had towels everywhere and no one would claim them. I ended up washing them constantly. The solution was easy: we let each child pick a color and they now own one towel each. We have hooks in their bathroom and their towels live in a neat row: pink, blue, orange. I grab them off the hooks and wash as needed about twice a week. In the event extras are needed (on laundry day or when company comes), we have a stash of guest towels. Don’t wash extra CUPS! Besides towels, we also had cups or glasses scattered throughout our home at all times. I want my family to stay hydrated, but trust me, it had become ridiculous! A couple years ago we made a coaster tray and it has made my wrinkled-dish hands SO happy! Make your own with this tutorial or look for one on Etsy! Keep your bag PACKED. This idea can work in so many ways, but for me it means having my purse ready to go by the door, having a summer bag packed with sunscreen, towels and pool toys (the Saltwater Canvas Whale Bag is perfect for this), keeping the kid’s backpacks filled and ready, and even keeping my daily toiletries in a bag that I can grab and go for trips. (NOTE: this does not mean having doubles of any items, just keeping the one item in a strategic container and spot). Don’t collect what you can BORROW. This has been a tricky lesson for me, but I have realized I can truly love a book but still not own it! Books can be borrowed from libraries, party supplies rented, even toys can be shared among friends. I have to remind myself, our family can have enrichment without ownership. ROCKIN’ ITEM ROUND UP. Announce round-up time twice a day (for younger children, it can be fun to play an upbeat song for this “challenge”. During that time, each family member patrols the entire house for all of his or her stray items and returns them to where they belong. Shoes, hairbrushes, jackets should all travel back to their home before the song is over. Of course, the ultimate goal is those items not be left out, but we have to start somewhere. Create ROUTINES and stick to them. We have found morning and bedtime to be tricky times and routines have really smoothed out the wrinkles. Our routines include: always leaving the house neat, always running the dishwasher at the end of the day (and always unloading while I brew the coffee in the morning), putting things away immediately when we come home and working together to complete chores on the weekends. 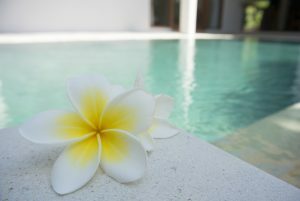 What ways have you used minimalism to simplify your life? Please share in the comments! Arlo Smart Home Security Camera System – Five-Camera Bundle Only $498!